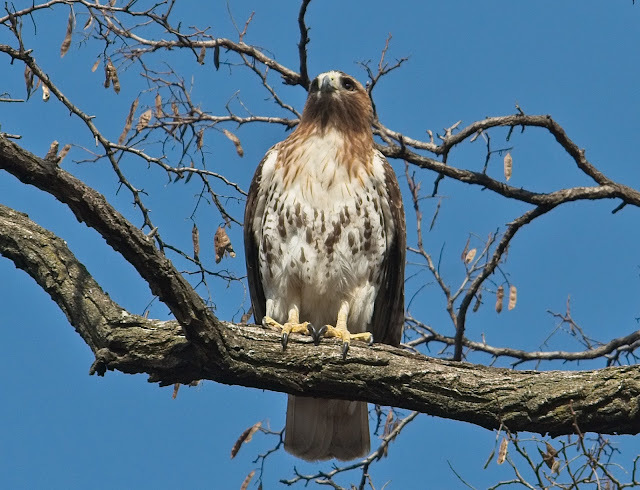 With so many red-tailed hawks around Tompkins Square recently, it can be difficult to tell them apart. How do we know who is who? Starting with Christo, he is distinguishable by his shape and coloring. He has a sleek and slender body with a squarish golden-brown head and white throat. His chest is mostly white and he has a light brown belly band. His thighs (not visible in the photo below) have light brown barring. He is the one who perches on the flagpole in the park (no other hawk does that) and he is the one we see most often hunting and catching rats. Below, Christo is on the left and Dora is on the right. She is larger, with a broader chest and often looks kind of disheveled. She has very 'swishy' feathers in the front that remind me of a 1920s flapper. Her head and wings are a dark chocolate brown and her belly band is darker. Her thighs have no markings on them. 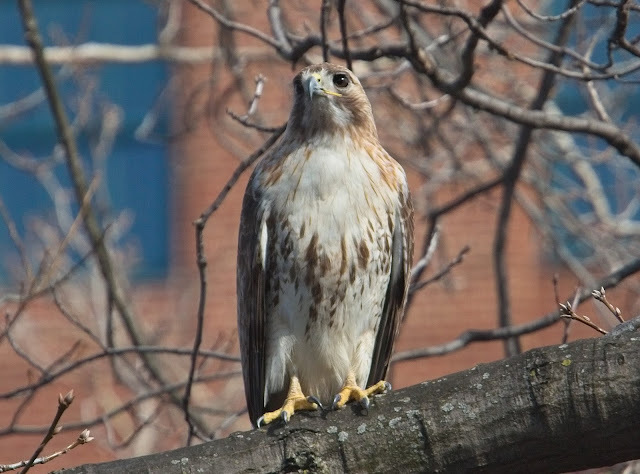 Most recently, she's had a drooping left wing that made her easy to identify while perched. Dora's eyes are dark brown. This is Amelia. While Christo and Dora look quite different from each other, Amelia can easily be mistaken for Christo when they are flying around. She is larger than him and her head is darker than his, but her brown coloring is not as dark as Dora's. She has a distinctive white patch between her eyes and the brown of her head extends down on the sides of her chest. It's not clear in this photo, but she has pronounced golden "eyebrows". Her eye color is a medium brown and you can easily see her pupils. I don't know how old she is, but if Amelia is young, her eye color could darken as she gets older. 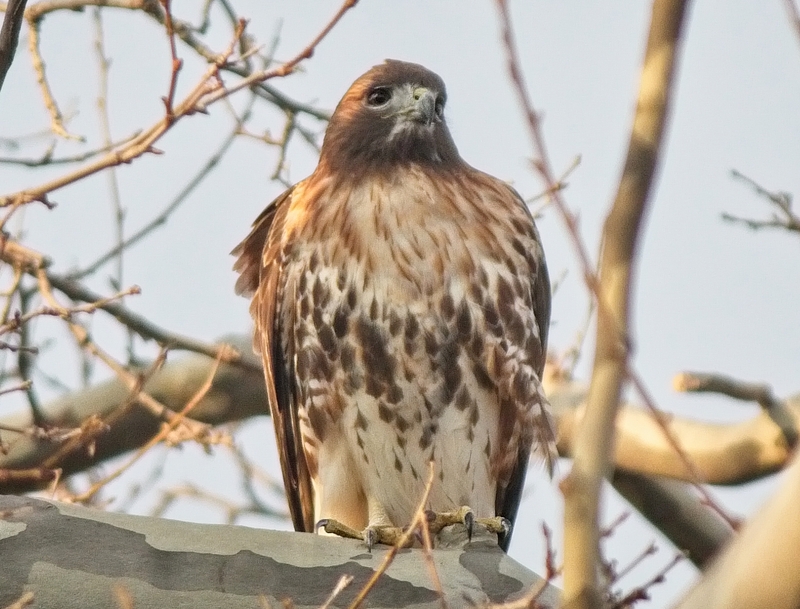 Barucha/Nora is a very colorful hawk, with a lot of rusty brown across her chest and along her flanks. She has a thick dark belly band and striking gray "eyeliner" feathers beneath her eyes. 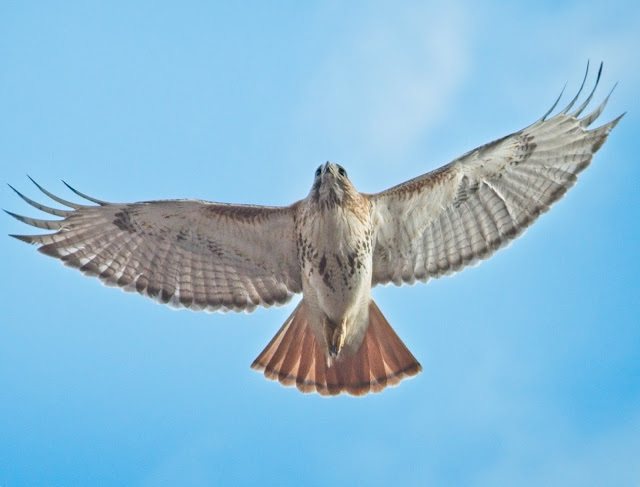 She's also a very large hawk. 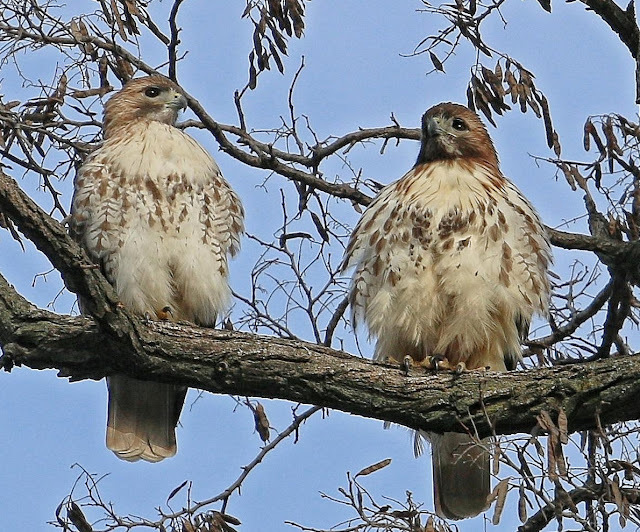 I don't know the exact weights and measurements of all the hawks, but I would say Barucha/Nora appears to be the largest. In flight, Christo displays a lot of white. His head is light and square, his throat is visibly white, and the tips of his wings don't have much color at all. His body is slim and a bit rectangular. 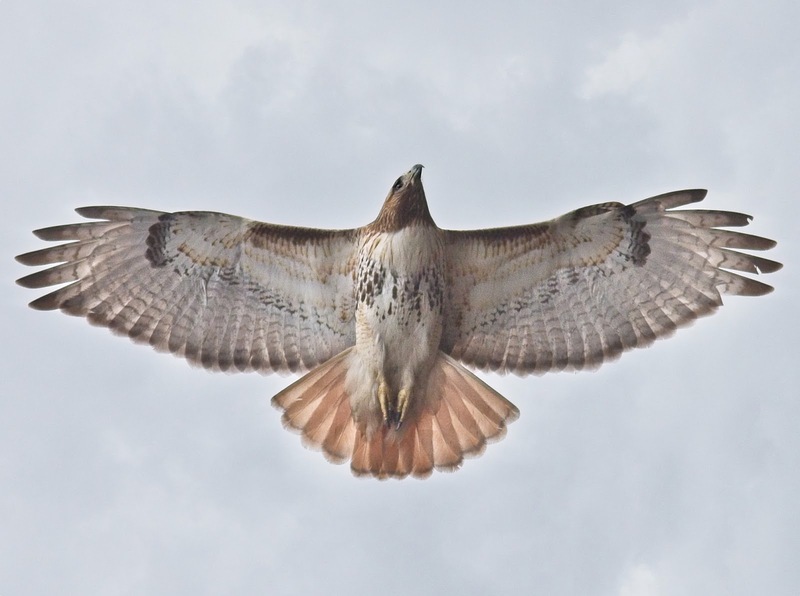 Dora shows more contrasting colors in flight, with her dark browns being clearly prominent. Her head and belly band are much darker than Christo's and the tips of her wings are dark. Her body is broad and somewhat bulky. Amelia looks similar to Dora in this photo, but her overall color is lighter. Her belly band is more sparsely colored than Dora's, but her wing coverts are more brown. You can see a light brown barred pattern on her legs. 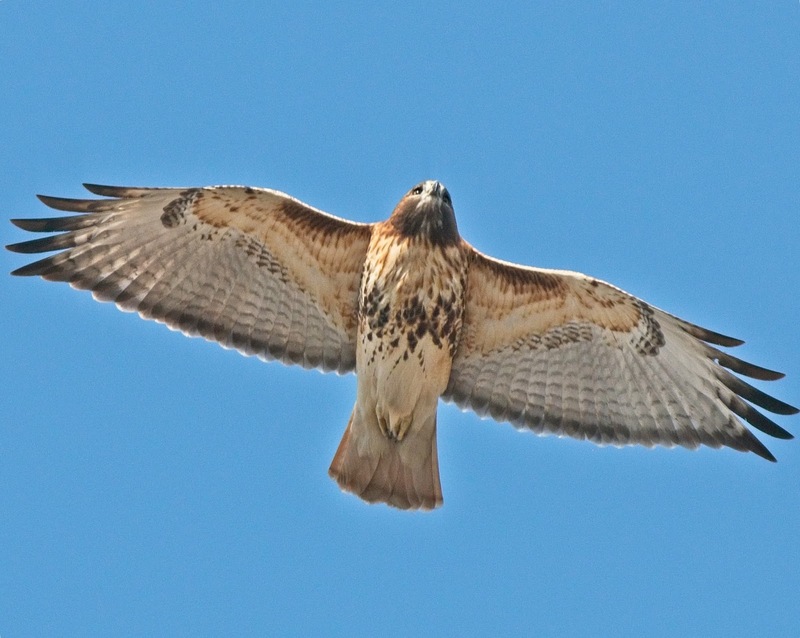 Barucha/Nora is much more colorful in flight and her wing tips are very dark. 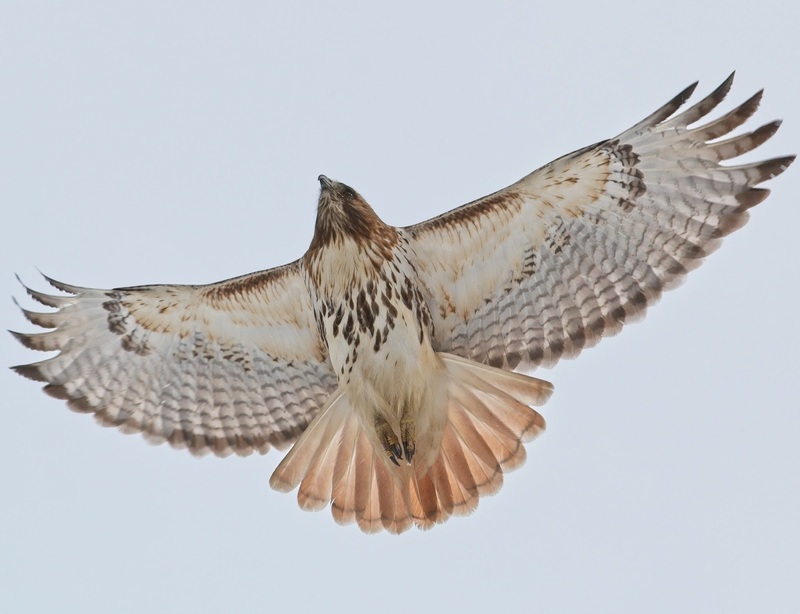 This photo doesn't do her justice, but you can really see the reds in her body as she flies. At this time, Dora is being cared for at WINORR, so she is not in the neighborhood. I'm not sure where Barucha/Nora is, but I suspect she is still on the Lower East Side. I hope to find out more about her whereabouts.